McKinalays are pleased to offer for sale this two double bedroom, first floor flat. 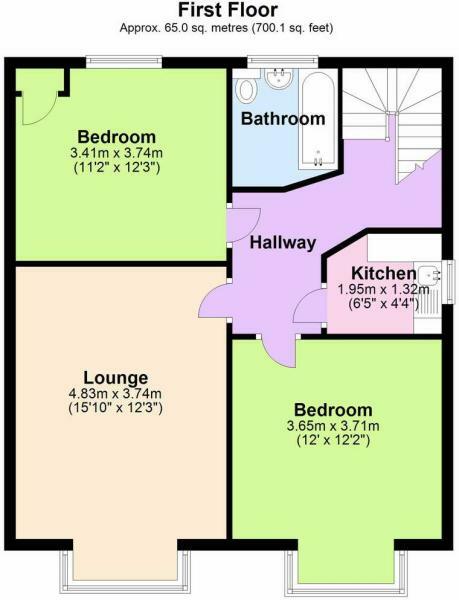 It has a large lounge / diner, kitchen and bathroom, there is central heating and some double glazing. It has a section of the rear garden, parking for two cars and the freehold. It requires refurbishment throughout. It is offered with no Chain. BATHROOM: WC, pedestal wash basin, panelled bath, window to rear aspect, radiator. BEDROOM TWO: Window to rear aspect, built in cupboard, radiator. LOUNGE / DINER: Double glazed bay window to front aspect, radiator, picture rail, feature fire surround. KITCHEN: Cooker point, single drainer sink unit with mixer tap over, window to side aspect. OUTSIDE REAR: Garden area with shed.